Clearwater, Fla. (WOFL FOX 35) – Clearwater Marine Aquarium released three sea turtles today at Fred Howard Park. 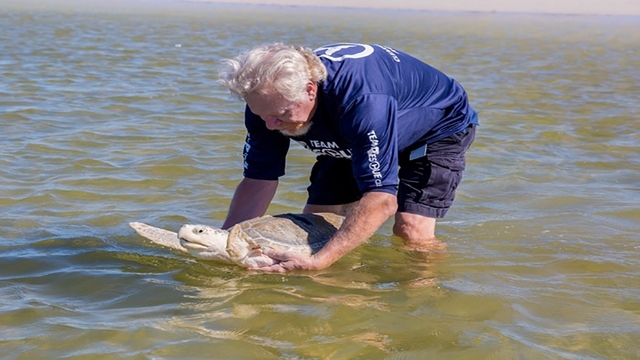 The sea turtles included Echo and Papa, two endangered green sea turtles treated for the Fibropapilloma virus, and Marigold, a critically endangered Kemp’s ridley sea turtle treated for boat strike injuries. Echo and Papa, named during the NATO phonetic alphabet theme, were rescued in January this year in Hudson Beach, FL. They were brought in with low body temperatures and tumors caused by the Fibropapilloma virus. Both sea turtles underwent successful tumor removal surgery and the Florida Fish and Wildlife Conservation Commission (FWC) cleared them for release. Marigold was rescued in October 2017 during the flower naming theme. The critically endangered Kemp’s ridley sea turtle was found by a fisherman on the Cotee River, near New Port Richey, FL. Marigold’s left lung was partially exposed through an extensive wound on her top shell and had sustained additional wounds on her bottom shell. The injuries are believed to have been caused by a boat strike.